PLEASE NOTE: This show has sold out! For information about future Aldous Harding shows, please sign up for our mailing list at the top of this page. We’re delighted to be working with Aldous Harding again – this time, at Gorilla, with H. Hawkline! An artist of rare calibre, Aldous Harding does more than sing; she conjures a singular intensity. Her body and face a weapon of theatre, Harding dances with steeled fervour, gnashing like a Banraku puppet. Her debut release with 4AD, Party (produced with the award-winning John Parish; PJ Harvey, Sparklehorse), introduces a new pulse to the stark and unpopulated dramatic realm where the likes of Kate Bush and Scott Walker reside. Igniting interest with her eponymous debut album released just two years ago, Aldous Harding quickly became known for her charismatic combination of talent, tenacity and shrewd wit. The album drew attention and accolades from some of the most illustrious corners of the music industry, receiving 4 stars in MOJO and Uncut, while UK blog The 405 hailed her a ‘toweringly talented song writer’. Created in Parish’s hometown of Bristol, Party saw Harding depart her New Zealand base in the antipodes for an intensive two-week immersion in the studio. Articulating her ambitions for Party to Parish was a galvanising process for Harding, with stunning results. The pair developed a near non-verbal shorthand, audibly evident in a raft of musical contributions from Parish. Alongside such special guests as Perfume Genius’ Mike Hadreas (having worked with Parish and toured with Aldous, it only took asking once), there is an exhilarating sense of risk throughout the record as Harding’s muscular wingspan extends. Teased out with inflections of experimental instrumentation and arrangements; Party is always anchored by Aldous’s intimidating command of her own songs. First single Horizon is a lover’s call to arms, powerful for its brutal simplicity and rawness of feeling, love and loathing colliding to devastating effect. 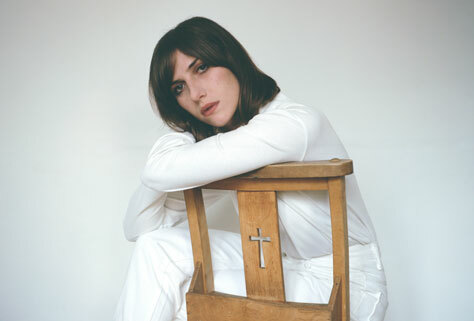 ‘Aldous Harding repeats the line as a mantra, as a truth, as a reality. It’s as if the gift of life is right here, with all its beauty and its limitations,’ said NPR. Imagining My Man commands an air of delicacy as Aldous explores the curiosity of a lover’s idiosyncrasies; steering listeners into a state of intense intimacy laced with hyperactive shots, dirgey saxophone and Harding’s aching voice. The track is one of two that Perfume Genius Mike Hadreas lends his inimitably sultry vocals to, the other being the intimate Party closer Swell Does The Skull. Blend sensitively ushers the mood of Harding’s flourishment throughout Party. Its opening lines a nod to the mood of Harding’s last record; sameness is quickly quashed with an electronic drumbeat and the announcement of Aldous Harding as an artist of stirring ambition and trajectory. The album’s eponymous single Party harks to Aldous’ earlier work; delicately pulling at the threads of a seemingly late-night love affair. Again, it’s not long until the rug is pulled out, with a searing chorus – Harding’s electrifying vocal accompanied by a choir of women and waves of percussive bass clarinet – piercing the balloon of expectations around Harding’s new record with effortless vigour. Renowned for the captivating state of possession she occupies in live performance, Aldous Harding has won crowds the world over playing alongside Deerhunter, Frankie Cosmos and Perfume Genius, as well as to hoards of eager crowds at SXSW, The Great Escape, Golden Plains and more. Aldous’ 2017 touring schedule spans Europe, the US and the United Kingdom for much of the year. Tour support comes from H.Hawkline. H.Hawkline (Huw Evans), who released his new album I Romanticize on Heavenly Recordings on 2 June 2017, has previously played with the likes of Foxygen, Gwenno and long-time cohort Cate le Bon. He also recently completed a run of shows with Devendra Banhart and King Gizzard & the Lizard Wizard, as well as a number of festival appearances over the summer.